Last weekend, I say a production of Marjorie Prime, a play about death, the nature of memory, and the lies we tell ourselves and others about the past. (There’s also a movie based on the play). Maybe about half way through the play, there’s a discussion about an upcoming trip to Madagascar. The “prime”, a hologram that looks like a deceased loved one and to aid in keeping memories, notes that, while there are many species native only to Madagascar, sailors brought the penguins with them in the 17th century, where their penguin descendants remain to this day. She looks up wistfully and notes that “Penguins are all that’s left of them.” Fade to black. I don’t pretend that I will have an outsized influence on history, much less connected to stranded penguins half a world away. But Masonry says we should “live respected and die regretted.” For all things Masonry, I look to the basic values to figure out how to do so: friendship, morality, brotherly love, relief, truth (I’m sure I’m missing a few, and temperance was never my strong point). If we conduct our lives (and organize our Lodges) according to these virtues, we will pass on knowing we left the world in a better place than we found it. You’ll note that nowhere in the previous litany of virtues is “ritual” listed. You’ll actually be hard pressed to find anywhere in the Wisconsin ritual anything about the importance of ritual except that certain portions of it must be committed to memory. “What makes you a mason?” is asked, and the answer is “my obligation.” What, then, makes a Lodge? Ritual is certainly necessary to confer degrees and obligate new Masons. But it is not nearly sufficient for an individual Mason, a Lodge as a whole, or the Grand Lodge jurisdiction. That is my objection to stressing too much the importance of ritual. The Grand Lodge line is that the ritual is what separates us from other organizations. If that’s all that separates us, I’m not sure why I’d want to be a Mason. It would be like going to church for the ritual alone and not to participate in the sacraments. But then I hear things about (and have attended) Lodges that meet to perform the ritual and then disband — all without welcoming visiting brethren, fraternity before or after the meeting, or even really liking each other very much. If the ritual is all a Lodge is, I would contend that it’s not really a Lodge at all. I would worry more about the Lodges that are not practicing the virtues than the ones that have ritual books open in Lodge. Our obligations to each other is what makes us Masons, and the practice of the virtues is what makes Brothers comes together as a Lodge. There are Brothers who have passed that I regret not for their perfect command of the ritual (although some had ritual cards), but that they supported and encouraged Brothers new and old and embodied the Masonic values. What I miss most about a passing Brother is that now there is an empty chair on the sidelines where decades of Masonic experience and encouragement used to be and will not soon be replaced. What I miss is commitment to growth, not of members, but of character and understanding. It would be a strange Mason who, on his tombstone, engraved “Here lies a man proficient in the Wisconsin ritual.” Make today better than yesterday. Or penguins will be all that’s left of us. 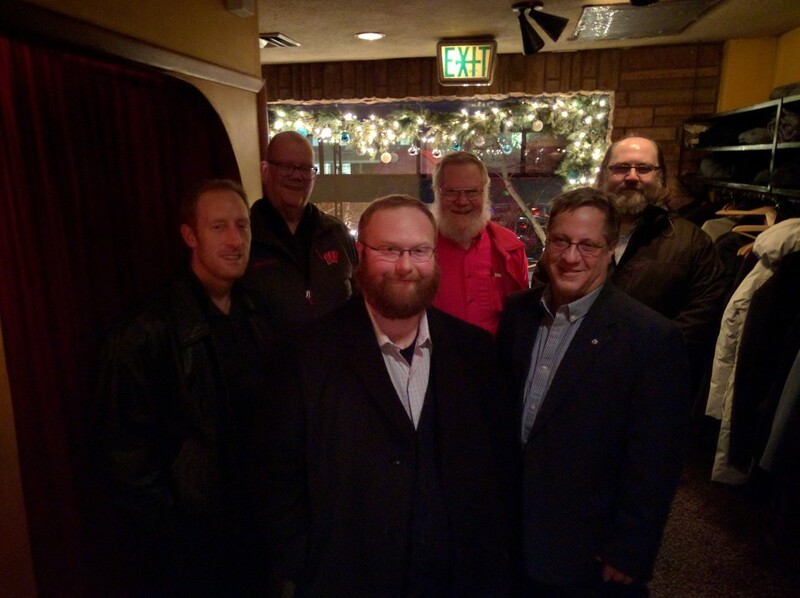 On December 26, 2015 the brothers of Benjamin Franklin Lodge celebrated the Feast of the Holy Saints John at the Tornado Steak House in Madison. After dinner they retired to Nostrano just down the street for desert. The Brethren at Tornado Steak House to celebrate the Feast of the Holy Saints John. 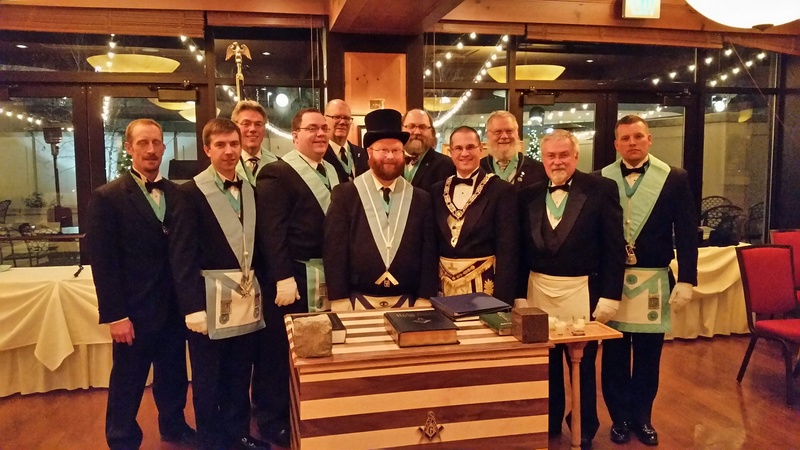 On December 9, 2015, Benjamin Franklin Lodge № 83 installed its new officers for the 2016 Masonic year. MWPGM Dan Slavik acted as Installing Master and W. Bro J. Patrick Storrs was Installing Marshall. The installation was held in conjunction with our annual holiday party where Brothers and their significant others came together to celebrate not only the upcoming holidays, but also brotherhood in The Craft itself. 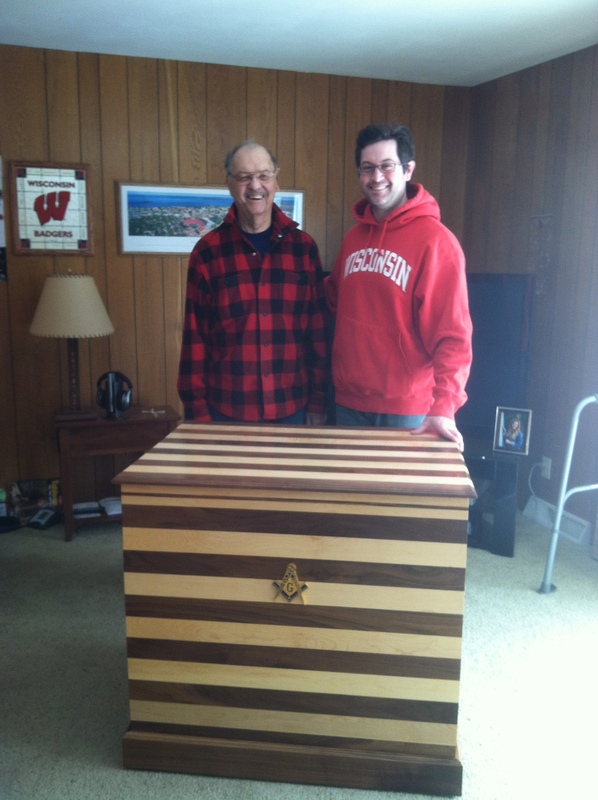 After the saw dust settled, Brothers Charles and Corey Kunde (father and son) delivered a beautiful piece of furniture to the Lodge – The Lodge Box. The craftsmanship is remarkable! From the inlay to the laser cut emblem, this was made with great care. The box is made out of hard maple and walnut. For their efforts, Benjamin Franklin Lodge 83 will donate $500.00 to American Family Children’s Hospital in Madison WI in honor of Charles Kunde. 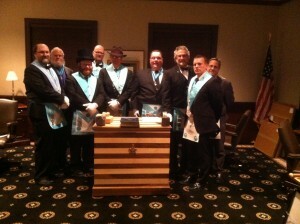 The Brethren of Benjamin Franklin Lodge No. 83 donated toys, games, books. art supplies, and $100 in Target gift cards to the American Family Children’s Hospital for use by its patients. 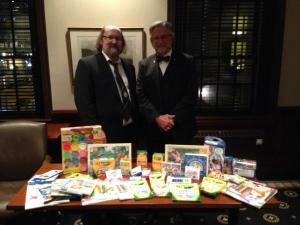 These items were collected from the Lodge’s members at the November stated meeting. 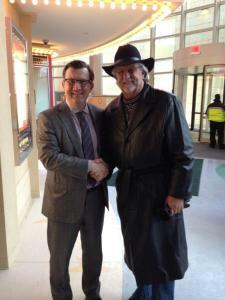 Donating items for patient use has become a annual tradition for Benjamin Franklin Lodge. 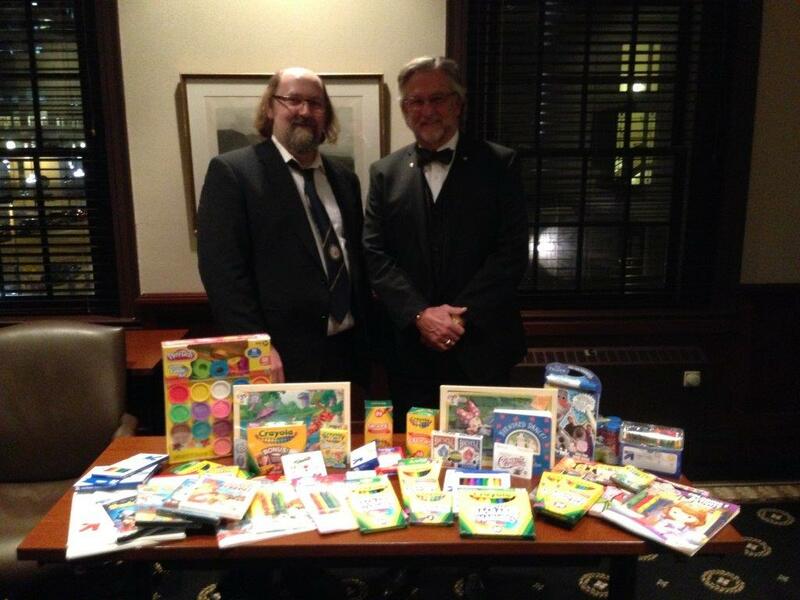 These items were delivered to the American Family Children’s Hospital by Merrell Tomlin, our Lodge Almoner. Jeff Poltawsky, Senior Vice President of the Children’s Hospital was kind enough to accept our gifts and pause for a photo. The Almoner remains an active and important office in many Masonic Lodges. His duty is to oversee the needs of the Brethren within his Lodge, and to act as the primary contact for the Lodge’s charitable works, as well as to look after the welfare of the members, including visits to the sick, aged and infirm. 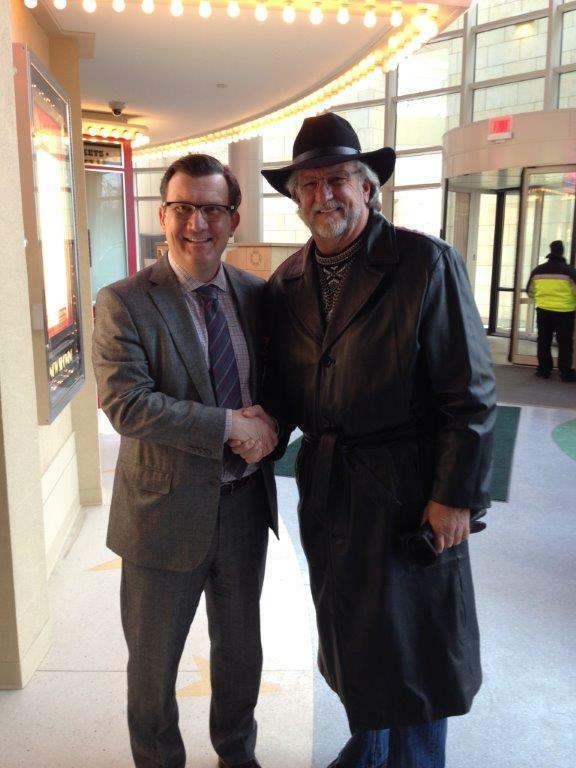 Jeff Poltawsky, Senior Vice President, American Family Children’s Hospital stand beside Lodge Almoner Merrell Tomlin. If you would like to make a gift to the children’s hospital, or would like to learn more about the items they want, more information is available here. An oft overlooked aspect of the Revolutionary War was the real possibility of failure when still in its infancy. During the fall of 1776, the British Army pushed out a fledgling Continental Army from all of New York City. This included defeats of Bro. 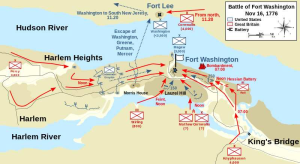 Gen. George Washington at White Plains, Fort Lee and Fort Washington (see battle map below). After these defeats, the Continental Army fled across New Jersey and crossed into Pennsylvania to escape. Not only did these defeats result in the capture of thousands of men and materiel-morale was running on fumes. Men were deserting. A strategic city and harbor-New York-had been completely lost and doubts were creeping in about Washington’s ability to lead his men. In fact, Gen. Washington himself had written to his cousin that “I think the game is pretty near up.” Generally, the condition of the Continental Army in early December 1776 could be summed up as haggard and desperate. 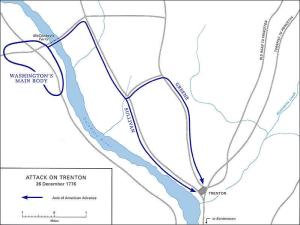 While conditions were bleak, intelligence reports indicated Trenton as being occupied by three regiments of Hessian soldiers, totaling 1,500 men. In contrast, Gen. Washington had a force of 2,400 soldiers. In an effort to boost the cratered morale of his troops, Gen. Washington planned an attack on this Hessian force during Christmas of 1776 (December 25-26). 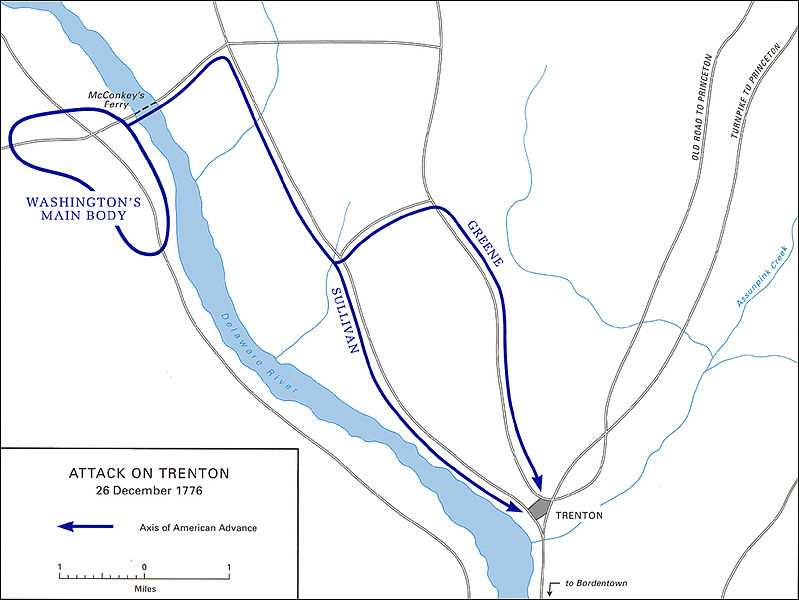 Originally, this plan called for a three-pronged attack, including a diversionary engagement of a British garrison at Bordentown, New Jersey. However, approximately half of the planned force was unable to make the crossing from Pennsylvania. 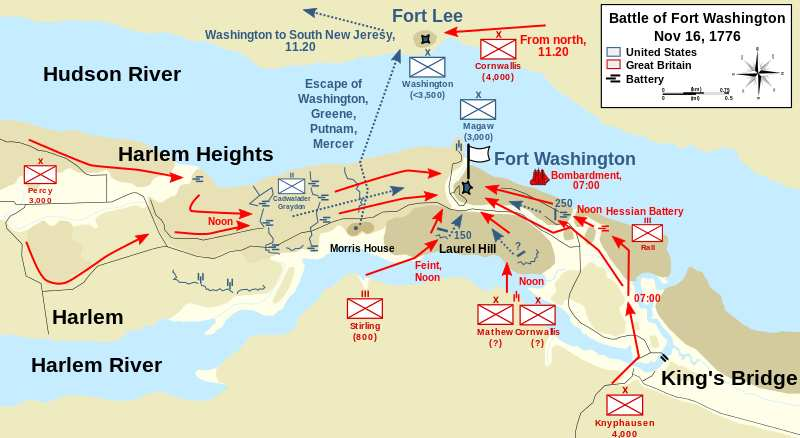 Fortunately, inadequate defensive positioning by the Hessian garrison, helpful citizenry and sound tactics mitigated this loss of manpower (see battle map below). A primary function of this successful battle was proving the Continental Army could actually match the fighting prowess of a European land army. Thus, the most important achievement of this relatively small engagement was a badly needed morale boost. The practicality of capturing Hessian materiel and supplies provided additional support to the army. This proved to be a pivotal point in the battle for America’s freedom from tyranny. On September 26, 1970, the president signed Public Law 91-424 creating the Apostle Islands National Lakeshore. This national park currently includes twenty-one of the islands in the AI archipelago as well as twelve-mile strip of land along the Wisconsin shoreline. The area is a marvel of red cliffs set against the stark blue waters of Lake Superior. During the summer months, the park is a popular tourist destination, largely for Wisconsinites and Minnesotans seeking to escape the cities further south. 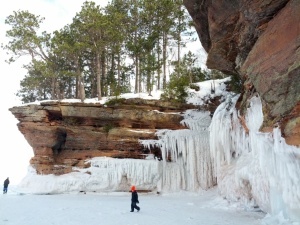 This year, however, the number of visitors to the park over the winter months soared as a result of the combination of extreme cold winter weather allowing the formation of ice caves along the cliffs with news frenzy across both traditional and social media outlets. 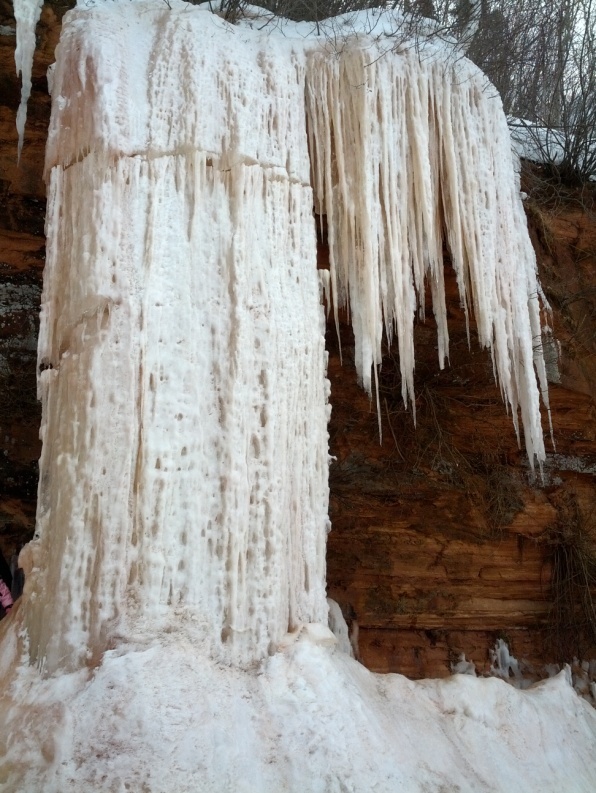 On January 15, 2014, the National Park Service published an announcement that for the first time since 2009, weather conditions were sufficient to allow the formation of spectacular ice caves along the mainland cliffs of the Apostle Islands National Lakeshore. 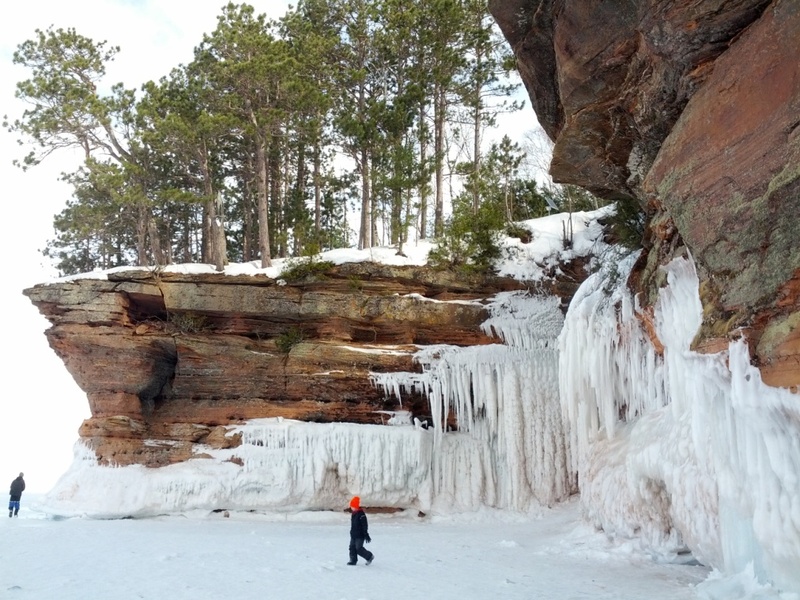 In just under two months, more than 120,000 visitors have flocked to the icy shores of Lake Superior to make the one mile hike from Meyers Beach to the caves. On March 11, 2014, the Wisconsin Radio Network reported this was higher than the number of visitors to the park for the entire year of 2013. By way of comparison, NPS’s recently released report for 2012 states that the park had 163,419 visitors for that year. Having heard about the caves on the news and viewed the photos of friends and family who had visited them already, on March 6 my wife and I loaded the kids into our car and headed north. 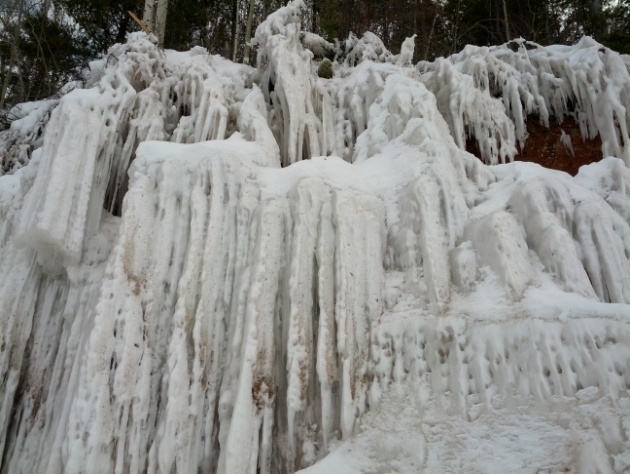 The popularity of the caves made finding lodging difficult in the northwoods, and the closest hotel we were able to locate was in Duluth – just over an hour’s drive from Meyers Beach. On the morning of March 7 we arrived at the entrance to the beach to find that the parking lot was full and cars were parked along the edges of the half-mile-long driveway and for at least another half-mile in each direction along the highway. Finding a spot to park, we bundled the kids into their snow gear, grabbed their sleds (we anticipated that our four-year-old was not going to be up for the full 5-6 mile roundtrip hike), and started following the line of people streaming toward the lake. The path along the shore was well-worn, making foot travel relatively easy. What we found when we arrived at the edge of the cliff-line was nothing short of amazing. 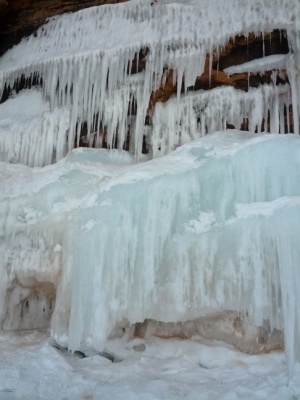 Waterfalls had frozen in place. Sheets of ice covered the openings of the sea caves, creating protected caverns behind their walls. In some places the cliff face was covered with patchwork patterns of colored ice. We walked a mile or so along the shore and took hundreds of photos. The kids found small holes in the ice wall and explored caverns set into the shoreline for which the entrances were too small for adults to access. Even our seven-year-old son, who had complained all morning that he thought the caves would be boring, popped his head out of a hole in the ice and with a huge smile on his face screamed to anyone in earshot that “this is awesome!” I have to agree with him. The overuse of the word awesome has lead to its diminution, if not outright bastardization, but in this instance the awe-striking natural beauty of the lakeshore made it perhaps the most appropriate word to describe our trip. In this day and age we are not used to mixing up our favorite cocktails a week in advance. But with homemade eggnog you will have to make it at least five days in advance to give it time to cure. This not only maximizes taste and texture but ensures that the alcohol cures the raw eggs. Mix liquors first in a separate container. Separate yolks from whites into 2 large bowls. Whisk yolks briskly adding the sugar in until the mixture turns a light yellow. Add liquor mixture slowly to yolk mixture, continuing to whisk until well incorporated (the mixture will turn brown). Continue whisking while slowly adding the milk and cream to the mixture. Set aside. Beat the whites of the eggs until stiff and fold into the alcohol mixture. Cover the mixture in an airtight container (like a gallon Mason Jar). Allow eggnog to cure undisturbed for several days (4~7) in the coldest part of the refrigerator, or outside in your garage (under 40 degrees) The mixture will separate as it cures. This is OK. Mix by whisking before serving cold. My grandfather was a Freemason for most of his adult life. He was very active in Racine Lodge, in the city where he lived his entire life. He and my grandmother were in Eastern Star. My father remembers many Masonic events growing up, mostly dinners and picnics. He was encouraged by my grandfather to join DeMolay, but he found that, at least in Racine at that time, he didn’t fit in with that group. He joined the Boy Scouts instead. Growing up, I had very little awareness of my grandfather’s involvement in Freemasonry. I lived in Worthington, Ohio, and the Grand Lodge building was right next to the church I went to. There was another Lodge building next to the allergist’s office where I got shots once a week for years. This is what you call a secret society hiding in plain sight. My parents knew these buildings were there and what they were, but they were not involved in Masonry, so explaining it to me was likely not a priority. Or maybe they did explain it to me, but I wasn’t paying attention. I didn’t become a Mason until after my grandfather had died. I’m not sure how I became interested in the Fraternity, but when I was 22 or so, I was on a long airplane flight, probably to San Diego, and I sat next to a Brother who was studying for a Scottish Rite play. Of course, I didn’t know that at first, but I noticed his Masonic ring and asked about it. He didn’t need much prompting to start and then continue to talk about Masonry for the next three hours. I expressed my interest in Masonry to him, and he contacted the Grand Lodge of Wisconsin, or so I presume, and within a week, I was contacted by Commonwealth Lodge. If you ask me why I became a Mason, or maybe more importantly why I’m still a Mason, I don’t have a great answer. I’ve seen plenty of candidates that made it through the first degree and stopped. I’ve seen others that were officers in their Lodges who stopped being Masons, including my brother. At Grand Lodge and District meetings, we are told that this is a problem and we need to reach out to these Brothers and bring them back into the fold. While I respect that view, sometimes we are better off if that Entered Apprentice who doesn’t have the time or continued interest in meeting with the members of a Lodge doesn’t show up for the next degree. Likewise, it’s sad that Brothers who have made great contributions to their Lodges stop participating, but life gets in the way of many things. Better a brother to remove himself from Lodge than cause discord among the Brethren. If people have other priorities in their lives, who am I to say Masonry should be more important to them than it is? Here is my answer: I joined Freemasonry because I was at a point in my life where I was looking for something more interesting to do than going home every night and watching TV for 6 hours. I continue to be a Freemason because talking to Brothers in Benjamin Franklin Lodge (through a haze of cigar smoke) about Masonic esoterica and the trials and triumphs of this life — continues to be compelling. 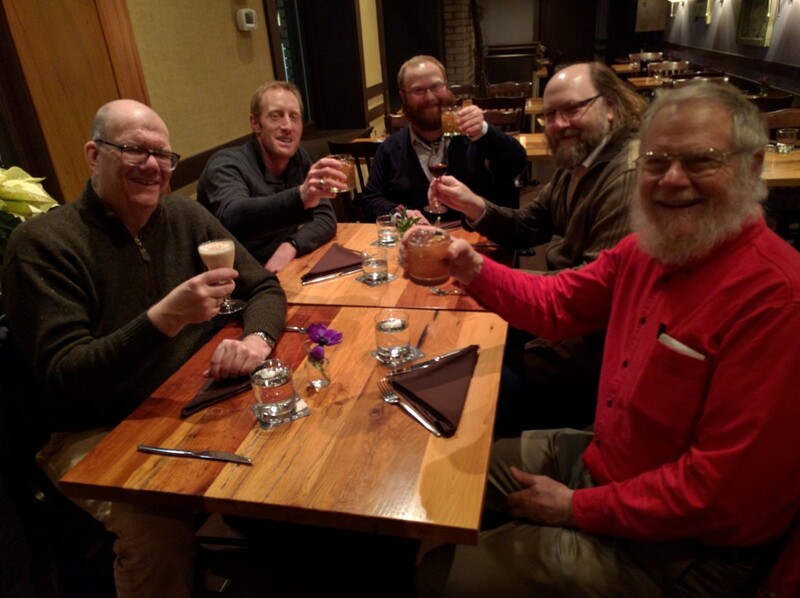 There is no Lodge, only men on the Level that are driven to continue to associate through ritual and fellowship — friends whom I found to be Brothers. 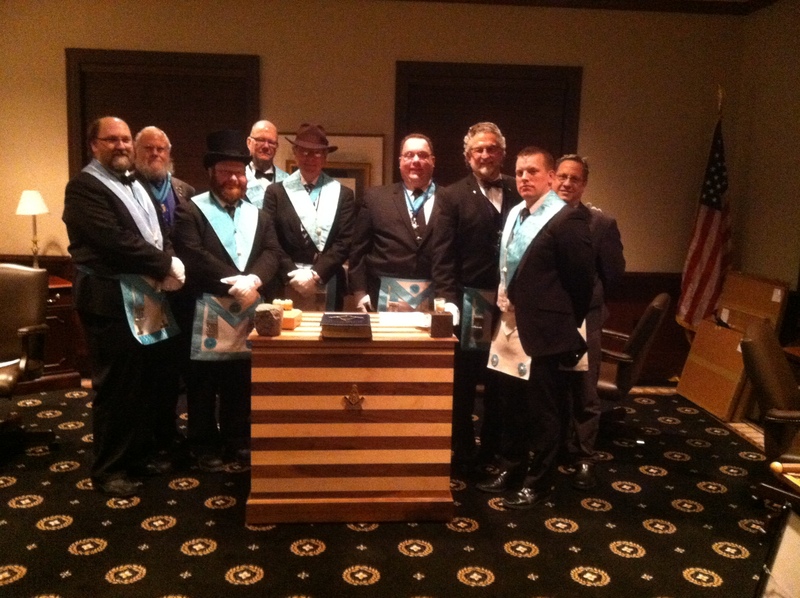 Benjamin Franklin Lodge #83 is a Masonic Lodge that meets in Madison, Wisconsin and works in the Emulation Ritual. 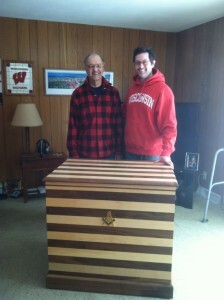 We are affiliated with the Grand Lodge Free and Accepted Masons of Wisconsin.